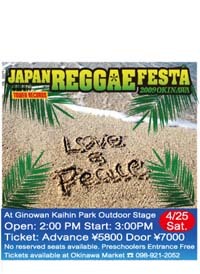 More than a dozen artists and groups have signed on for the Japan Reggae Festival 2009, slated for later this month at Okinawa Ginowan Kaihin Park. Advance tickets for the April 25th concert are now on sale at Okinawa Market on Chuo Park Avenue in Okinawa City. Read More! 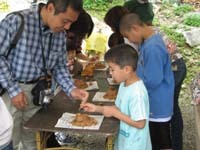 The sweet potato and Yomitan Village are becoming synonymous in the west central Okinawa community, where nearly one-third of the island’s distinctive purple sweet potatoes are grown. 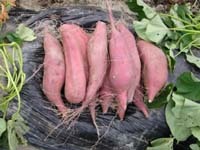 Sweet potatoes have been an integral part of Yomitan’s history, growing tons of the vegetables long before World War II. Read More! Jeff Newton poured in 23 points against his former team as the Ryukyu Golden Kings upended the Osaka Evessa Saturday, 85-79, only to see the Evessa hang on in Sunday’s nail biter for a last second basket and a 69-68 win. Okinawa had picked up a one-point lead on Jeff Newton’s basket with two seconds remaining, only to have Osaka set up a final play during a one-minute time out. Read More! There are plenty of choices at Samurai, located in Okinawa City, but seafood rank at the top of the list. Sushi, sashimi and tempura are popular, but the really big favorite is the Samurai Boat, which features a mix of items that can include baked meat and fish, skewered entrees, salads, fried foods and more. Read More! The shishi dog absolutely rules this weekend at its birthplace in the Tsuboya pottery district of Naha City. The three-day Tsuboya Shishi Festival runs Friday through Sunday, paying homage to Okinawa’s finest pottery, which dates back to the Ryukyu Kingdom era centuries ago. Read More!